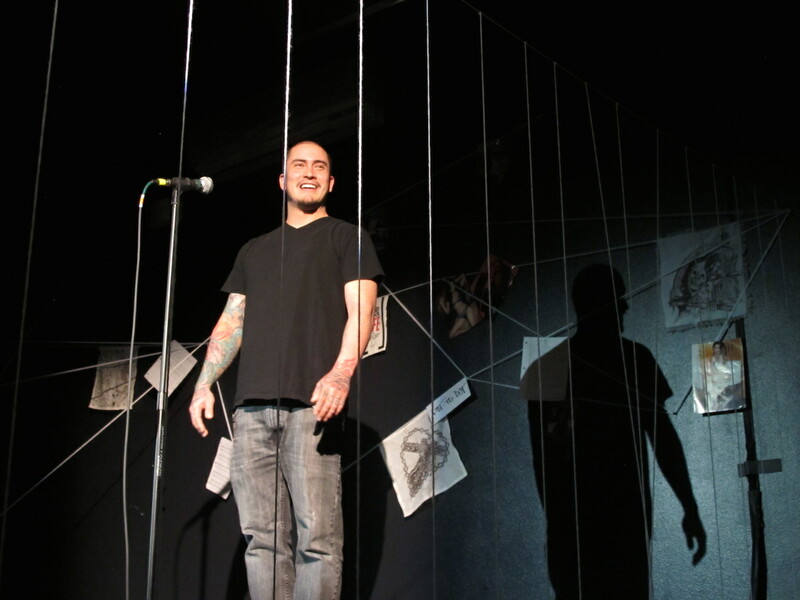 ­ALBUQUERQUE — Carlos Contreras glares down from the stage at Tricklock Performance Laboratory, animated and preaching into the mic like the National Poetry Slam champion that he is. Behind him, photos of detention center inmates hang on clotheslines, among assorted drawings, writings, and clippings. “Working in a correctional facility is not most people’s cup of tea, idea of fun, or means of making a living,” he says. “However, with more than 2 million Americans behind bars, the Department of Corrections is a thriving industry.” He abandons his post, to stare back into the faces on the clotheslines, giving them attention so that we will as well. 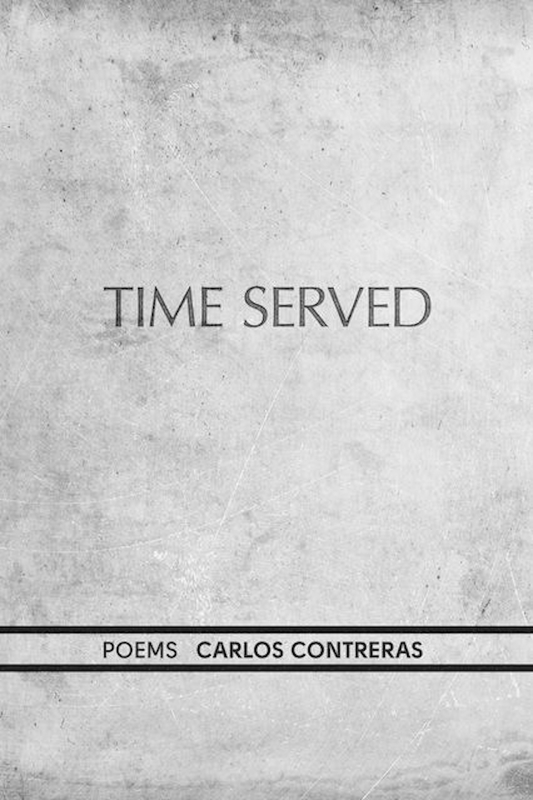 This is Time Served — a one-man show Contreras developed concurrently with a book of poems for Tricklock Theater Company’s international festival, Revolutions. The 15-year-old gathering brings performers and playwrights from traditions and locations all over the globe to Albuquerque. By centering the Duke City as both an artistic nexus and as a community in conflict, the Revolutions program addresses the intersections of community, performance, and resistance. The 2015 lineup drew participants from Ukraine, Austria, Armenia, Israel, Iran, and the U.S., and concluded with a weekend symposium on storytelling, especially as it relates to communities in conflict. Titled “The Ritual of Story on Stage,” the symposium asked theater artists what they were doing in their own communities to create understanding and face social unrest. In Contreras’s roundtable discussion, for instance, the conversation centered on the rights and responsibilities of appropriating stories for theater. I worried that Time Served would reinforce racial stereotypes, sentimentalizing or sensationalizing lives that real people experience, for an audience of voyeurs and consumers. Orange Is the New Black does this, for instance, by placing the mostly female, largely women of color cast within the framework of an idealized white woman whose identity is constantly in danger of being “corrupted” by her (racialized) environment. This is not a critique of Time Served — only a description of the, admittedly skeptical and academic, pretext under which I attended the performance. You might say that I went to, in Lucy Lippard’s words, “confront the contradictions of lived experience.” Theater often faces such contradictions in the space between the performance in toto (the script, the direction, the acting, the set design, etc.) and the ways in which the viewers process it through their own experiences. The symposium — co-sponsored by Tricklock and the loosely organized international organization Theatre Without Borders — specifically addressed this liminal theatrical space, suggesting that storytelling is a sort of collective performance involving both the teller and the listeners. Revolutions, in promoting experimental and people’s theater as a form of social intervention, got me thinking about how such performances might act as a sort of ethnography for a place like Albuquerque, where a history of racial conflict has culminated in systematic police violence, much of it directed at homeless Navajos. A place like Albuquerque: where university and city officials fail to recognize that converting a homeless shelter into a “business incubator” underscores the essential problem with “creative economy”-driven initiatives. How might stories and performances undermine “common sense” imperatives behind law enforcement or economic policy? The symposium session on storytelling circles offered an answer — one that provides a basis for my criticism of Time Served. The session began with a simple prompt: “Tell a story about a moment you felt true belonging — or the opposite — in this country or in your community.” The participants divided into small groups and began sharing their stories. Afterwards, they shared with the larger group how much they all had in common. In Time Served, meanwhile, stories are too often condensed into easy abstractions, even clichés like “broken homes” and “fresh fish.” They become placeholders for real experiences that simultaneously strip inmates of agency and fail to address the structural conditions that don’t give them much choice. The problem with clichés, of course, is that the images and ideas become meaningless, and in this case they all slide into racial stereotypes because we struggle to connect Contreras’s words with the faces in the photographs. Yet, where he tends away from the particular experiences of inmates, he steers toward intimate domains of the audience: “In rural communities, the members of the general population were once members of society outside … Before they were inmates, they were shopping at your grocery store, pumping your gas, doing your taxes, serving your drinks, and drinking right beside you.” The line, “Drinking right beside you” is an important shift from the idea that inmates once worked in and occupied “your” space to one of sitting among you. 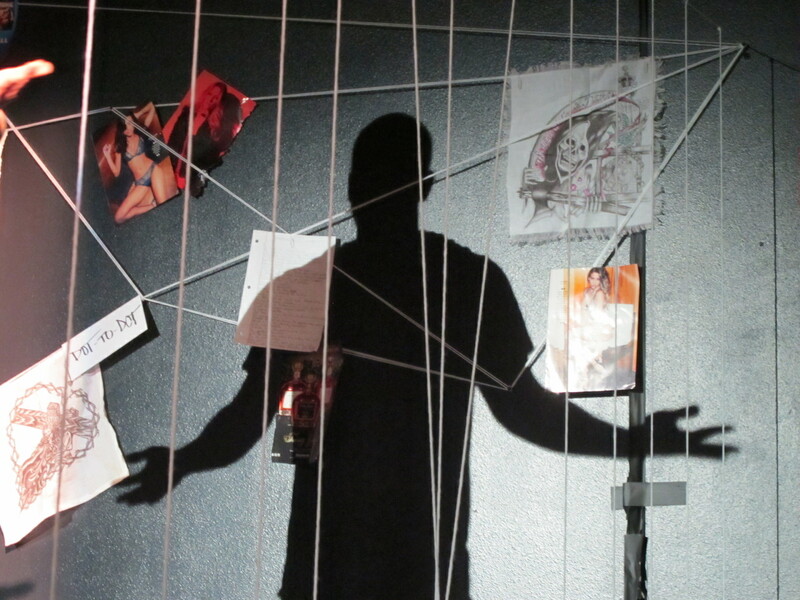 Later in the show, as if to contest his own notion that “we are all human beings” — as if to demonstrate the clear line between who stands to receive the full benefits of humanity and who will be denied them — Contreras hoists long lines of white string horizontally across the performance space. Every four inches or so, a line hangs to the ground, weighted by a toy soldier. The immediate implication is obvious: the string has formed a jail cell, a cage, with Contreras inside. 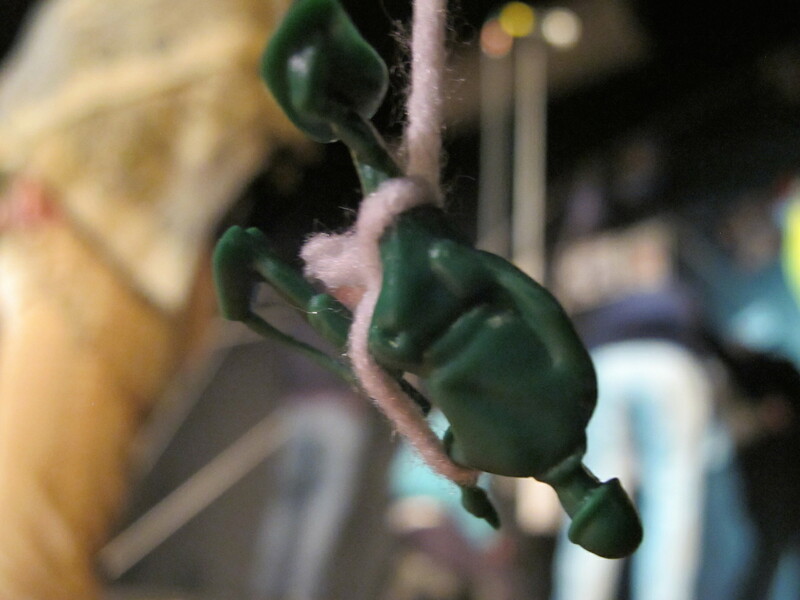 However, the toy soldiers might also refer to Contreras’s book of poems, producing a visual representation of the underrepresented first half of his book: he seems to be suggesting a link between military service and prison — soldiers literally tied into the system. 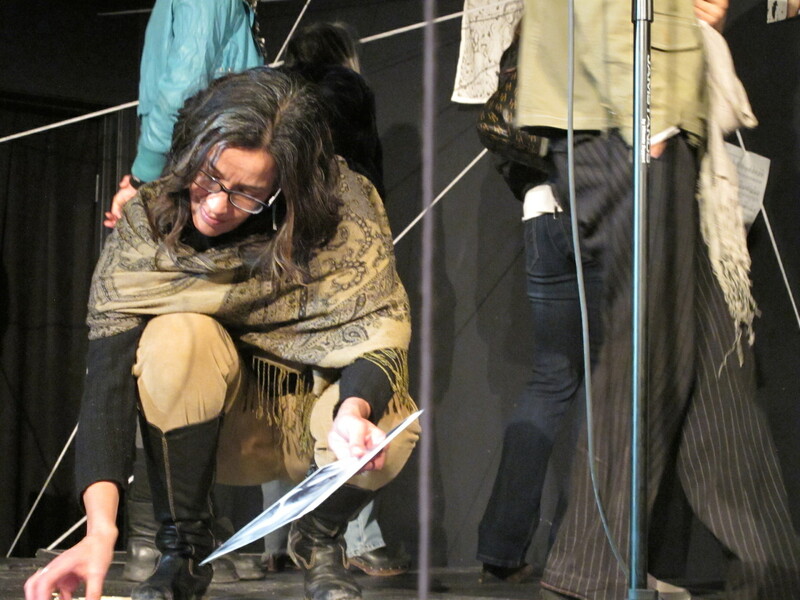 After the performance, Contreras invited participants to approach the stage, to look at the photos, and to linger until the taps (provided gratis by ABQ’s Tractor Brewing Company) had run dry. I sat in my seat for a minute, head full of hard cider and wine, worrying that in a postmodern, post-structural world, live theater fails to communicate foreign (at least to many) experiences by inviting the audience to participate: Are we too aware of the theater as a controlled or fabricated experience to see people as anything but characters or props? Are we too aware that we are supposed to care? I felt helpless, having no context for the clichéd realities of prison. But saying I can’t relate is just an easy way out, one imbricated in the still-common conception that stories about white men are universal, while those about people of color are always automatically about race, as if “white” isn’t a race. I write this fully aware that Contreras intends Time Served to be about prison, rather than race, the “general population” reflecting the people of Albuquerque, as he has said, but I can’t deny that the photos on the stage of Latino and Mexican-American men in prison exist in a colonial state of dispossession. The tensions outside the theater and those we take up inside reveal our discomfort with difference — a difference that becomes the basis of any number of anxieties and practices of a society still living out the Enlightenment. We miss, over and over again, that race as we know it is also always tied to capital — a series of hierarchies within hierarchies, like nesting dolls of privilege. Time Served ran January 27 and 30 at Tricklock Performance Laboratory (110 Gold Ave SW, Albuquerque, NM) as part of the Revolutions International Theater Festival.